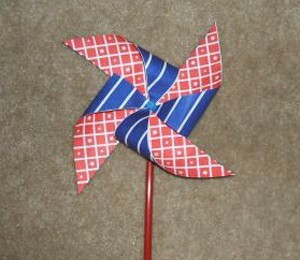 Kids will enjoy making and playing with these pinwheels. They are very quick, easy and inexpensive. Cut out a 6 inch square from each piece of card stock. Glue the two squares together, with the blank sides facing each other. Draw an "X" from corner to corner. Cut along the lines, stopping one inch from the center. Fold every other corner into the center making sure they overlap slightly. Insert a push pin through the center and secure it to a straw. Put an eraser on back over the pin to hold it in place. Very good idea. I get these from Kmart for my garden to help keep critters out, good luck.